Could not have said it better myself. Love the post-its by the way. 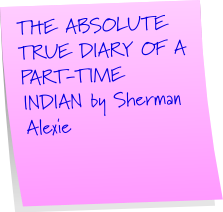 Post-it shout out!!! What's not to love!!! I love this stand out and I'm with you! 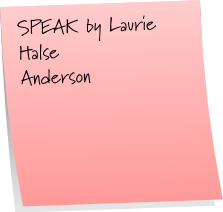 I've bought Speak to help Laurie out because her voice should be heard!!! To Kill A Mockingbird & Catcher in the Rye are my two favorite books. 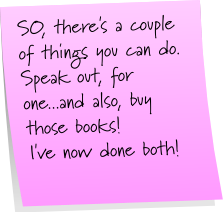 I own them both, and when I am published and they ask me what books I enjoyed the most, those would be my two. Hear, hear!!! 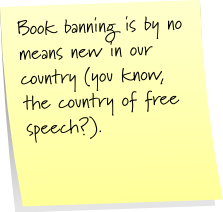 It's silly to ban books. 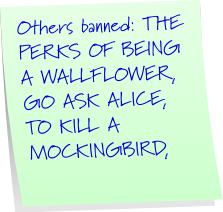 The banned books list doesn't do anything anyway; those people are just wasting their time fighting against books when they could be volunteering instead! 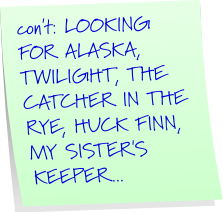 I don't know anyone who refuses to read the books on that list. Most of the books I've had to read for classes in grade school and high school. And I went to conservative Catholic schools, so if they think banning books is silly, then that's saying something! Perfectly said. I'll admit, I didn't know about half of these but I WILL continue to encourage my kids to read them all. Huck Finn, really? I think my 11 year old has read this one 3 times already. I have mixed feelings about this. 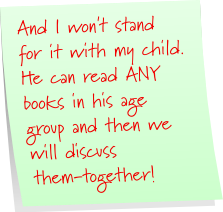 On one hand, I think it is the parent's responsibility to "police" what their children read. I think in a public library, any and all books should be available. In a school... well, books containing adult material/themes should not (like Twilight... I don't think is appropriate for elementary/early middle school). Grrrr! That makes me sooo mad! And because I am a *dork* fan, I have to mention HP. Because obviously it teaches about witch craft and evil doing/sarcasm/ Nobody can tell me or my kids what I can or can not read. It's a choice. Grrr. Okay...I will get down now, and let the next person have a turn. My 14 year old daughter reads everything, and Speak is one of her favorites. Book banning makes me steam up. Grrr. *gives standing ovation* Thanks for saying this better than I ever could. So true!! Tired of all this censorship stuff. Why should a small minority rule what's available to the rest of the population?? It always amazes me when other people think they know best for my child ... or me for that matter... I volunteer at a school library and I've seen parents come in to complain that we have certain titles... my response is to ask if they've read the book? I'm going to the bookstore today! So many good, important books have been challenged. I can't remember if I've said this on your blog before or not but I will reiterate just in case. Banning books doesn't work. You may as well try to ban knowledge. Both literacy and literature are basic human rights as far as I'm concerned. That all being said, I hope someone tries to ban my book if I ever get it published. There's nothing like a little controversy to raise awareness of a story. No way, those are some excellent books.